The weather gods smiled down on Bearded Theory again this year: I can only imagine it was at the sight of so many hirsute individuals disporting themselves in the Magical Sounds dance tent, stomping along to The Levellers on the main stage, or maybe it was the giant pink puppets prancing about the festival site. 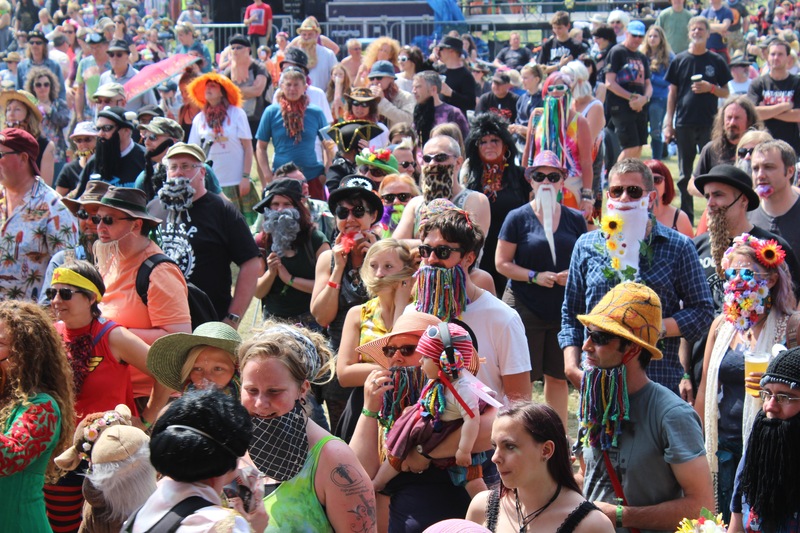 Each year, Bearded Theory festival puts in a few tweaks and improvements, while staying true to its original ethos. It’s a formula that obviously works as the festival constantly sells out in what has become an extremely crowded marketplace. 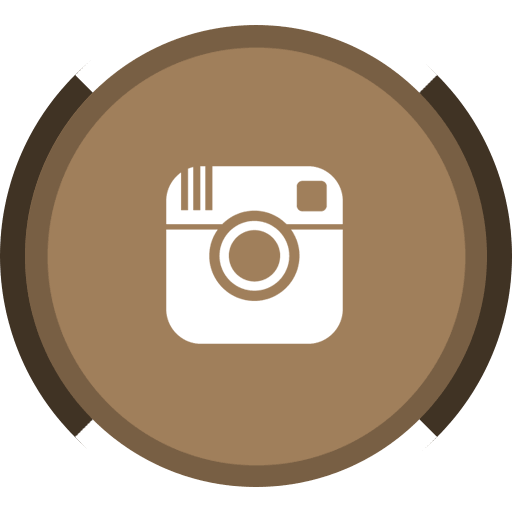 For this year the lovely little Woodland stage, set in a shady glade behind the main stage, had been given a spruce-up with some cosy looking hammocks and mushroom-themed decorations. As well as its own bars, it was a pleasure to see Nana’s Kitchen again, offering sustenance in the form of huge slabs of home-made cakes (lemon drizzle and Victoria sponge were delicious) plus roast dinners. 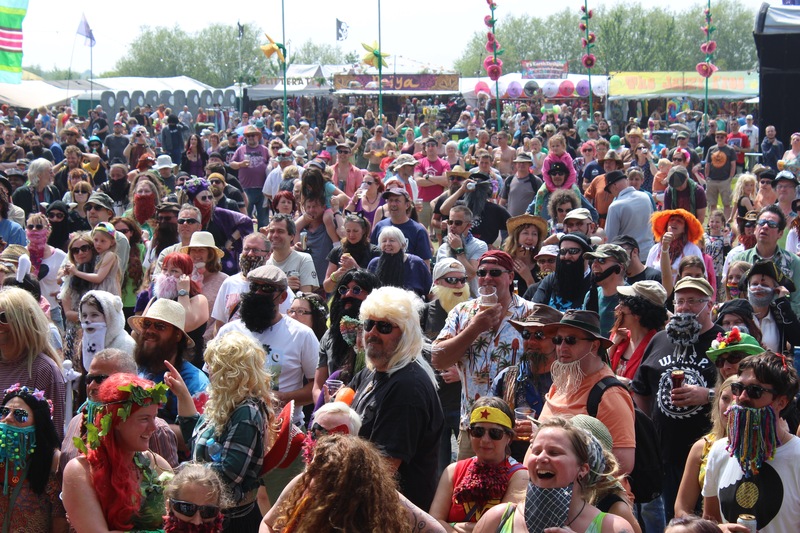 With the Woodland this year hosting Jack Savoretti and Stiff Little Fingers, the area is no longer confined to the more folky/hippy acts. There’s not much improvement needed to The Pallet main stage but it was adorned by two huge sculptural steampunk torches which belched flumes of fire, complete with menacing spiders. 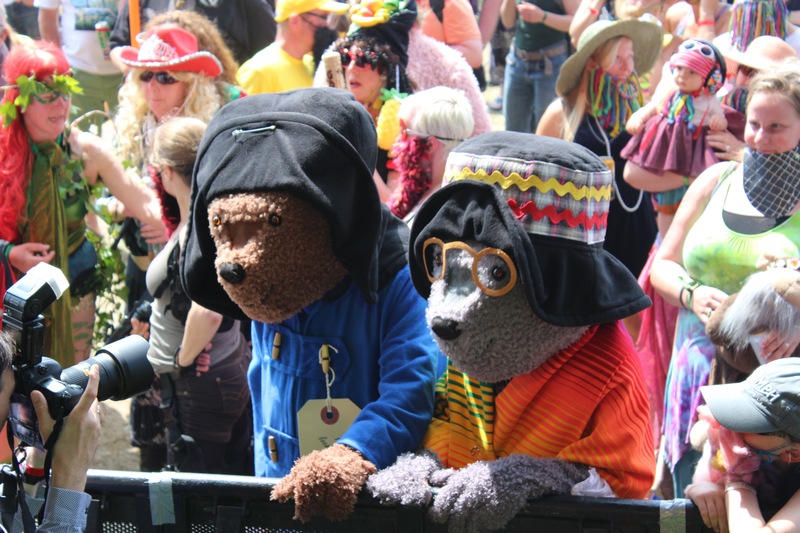 And I would hazard a guess that the sound systems had been overhauled as both the main stage and Woodland had impressive, full and well balanced sound. There were other stage changes, with the new Maui Waui tent hosting mainly a series of energetic electro swing outfits – we enjoyed The Lounge Cat Ideals (below). The festival’s famed OFSTED-approved school was in operation again – I spoke to one of the maths teachers and was amazed to discover just how much work BT put into running it, they even provide one-to-one support for children if it’s required. There’s more than school going on though, as the children’s village is a huge, safely bordered area bursting with activities, and even its own cafe. Main-stage draws on Friday were Reverend and the Makers. who delivered a set of dancey anthemic numbers designed to rouse the crowd into party mode. Another Bearded Theory staple, The Levellers, created a set worthy of their headline status, initially projecting blizzards of confetti into the crowd before ushering in a tried-and-trusted blast of hits such as England My Home and One Way. The music highlight for me and seemingly for plenty of others, judging by the reception, was a late-night appearance by Turin Brakes at the Woodland stage. It’s good to see they have a legion of fans, despite their slightly under-the-radar status. They delivered a set of utter beauty, with the uniquely expressive vocals of Olly Knight set against their easy-going acoustic feel. The band are currently touring their new album Lost Property and announced they had not played a festival set for a long time. It was good to see them feeding off the positive crowd vibes and giving it back to us. They played their latest single Jump Start from the new album, and ended with a pepped-up version of Underdog. 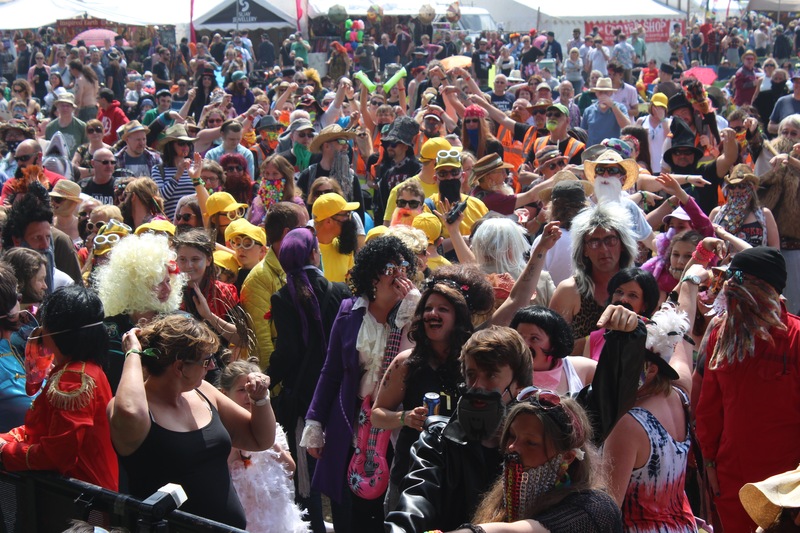 Over the weekend, the Pallet stage played host to a procession of old-school bands with sets from Black Uhuru to Squeeze to PIL. Saturday afternoon presented slightly more reflective entertainment. Wilko Johnson showed he’s back in fine form, having regained his vocal power and the stamina to play a full set plus an encore. He remains a magnetic stage presence, giving us the crazy staring eyes and the slidey walk. He was followed by Billy Bragg, who played in the main a solo set, opening with The World Turned Upside Down. Bragg was on great form, with banter between numbers that veered from the amusing to as always, the political. With the force of his convictions, he found a way, even on the huge Pallet stage, in front of thousands, to make you feel as if you were watching him at some intimate little venue. 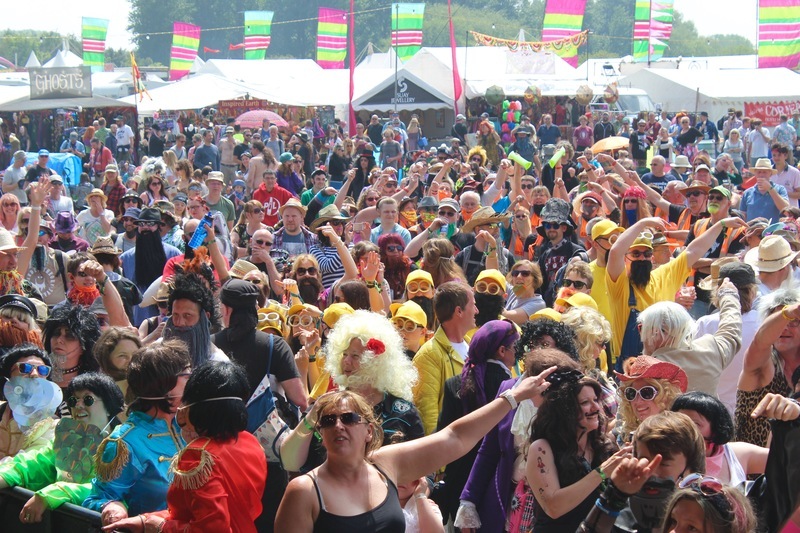 On Sunday there was a slight clash as Stiff Little Fingers were set to appear on the Woodland stage while Asian Dub Foundation took to the Pallet stage for the closing act. Asian Dub Foundation, no strangers to Bearded Theory, came out all guns blazing and played a truly powerful and energetic set. There was an entertaining moment when Nathan Lee, on flute, managed to beat box at the same time. We were treated to Fortress Europe, which suddenly seems topical all over again, plus many others including Fly Over and La Haine. 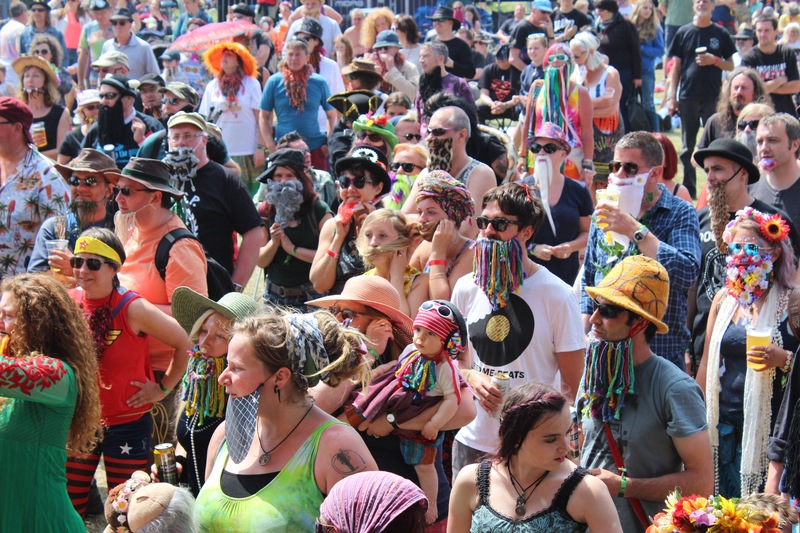 Sunday at Bearded Theory is as always as much about fun as it is about music. 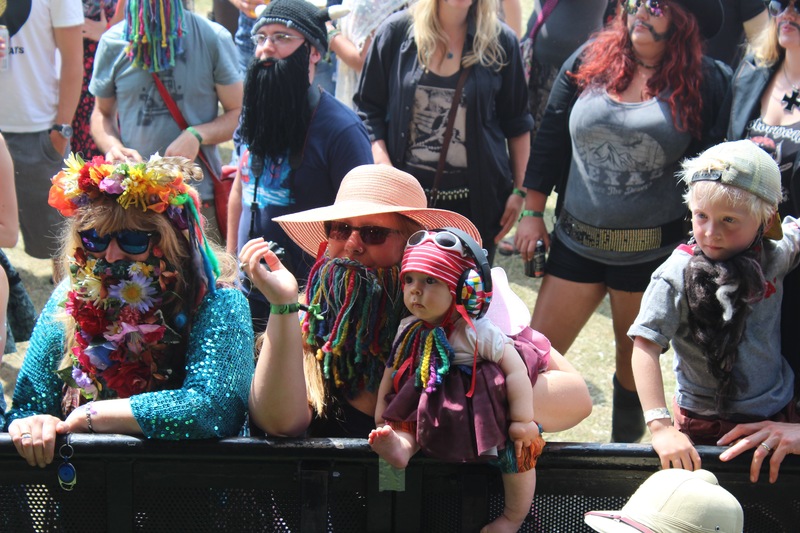 The annual beard competition took place, with those who had made a creative and original effort called onto the stage. 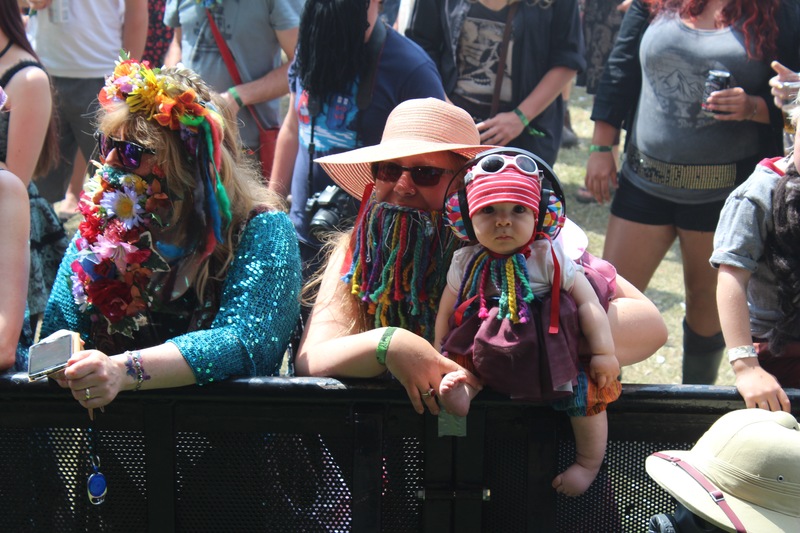 The final two were a group of young minions and a bloke who had fashioned a beard from backstage passes. The minions won the day. Magical Sounds dance tent continues to be one of Bearded Theory’s most treasured and unique destinations and it had undergone quite a makeover, now sporting beautiful oversized glowing lanterns. The tent primarily featured a blend of trance, dub, psychedelia and punk. On Sunday it was a pleasure to discover Kangaroo Moon. The global group’s starting point is folk in celtic/aboriginal style, which takes unusual and experimental paths, veering into jazz and electronica with the didgeridoo blending seemlessly into their more electronic compositions. So it’s all over. Back to work, and cold weather, but with some great memories of this year. 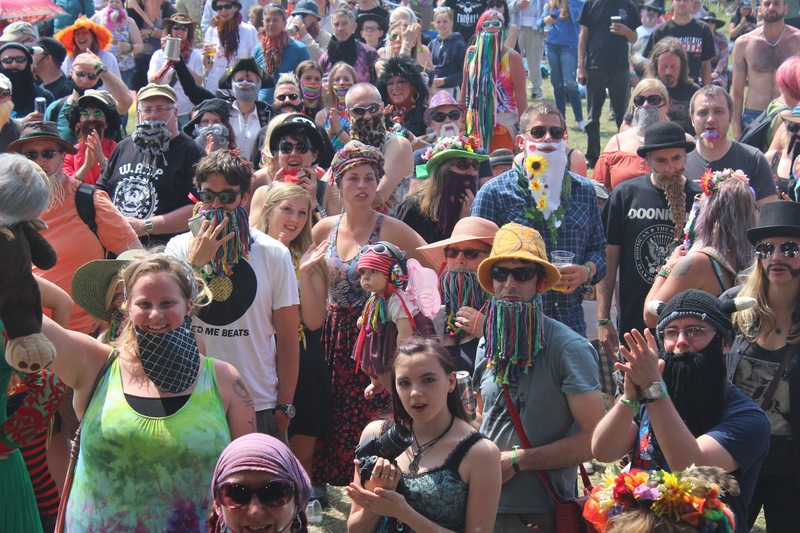 What always comes across at Bearded Theory is the feeling that behind the scenes are a passionate and committed team, it’s most definitely not one of the corporate festivals squeezing a few more thousands onto the site each year. 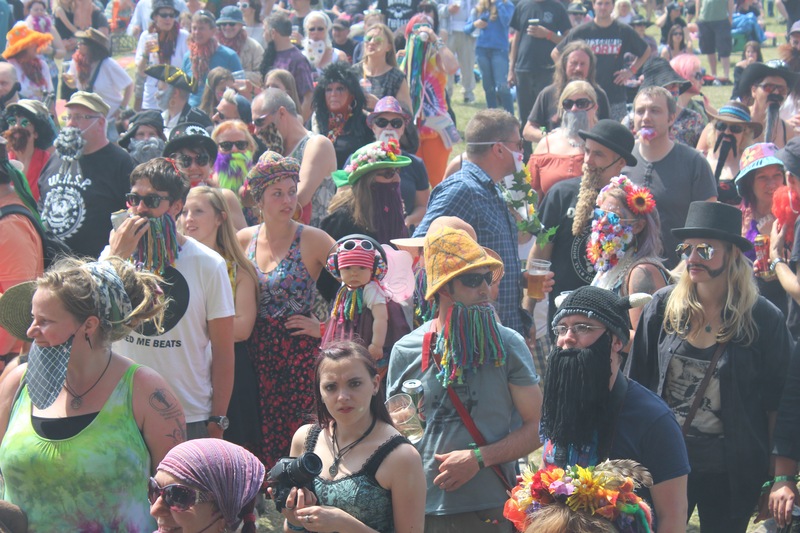 You can ‘organise’ your festival as much as you like but what you can’t factor in is the vibe, and the friendliness of the people, and this is what Bearded Theory manages to pull off, year upon year. I’m already looking forward to the next.